And now, for something deliciously serious. Do not take my word for it. 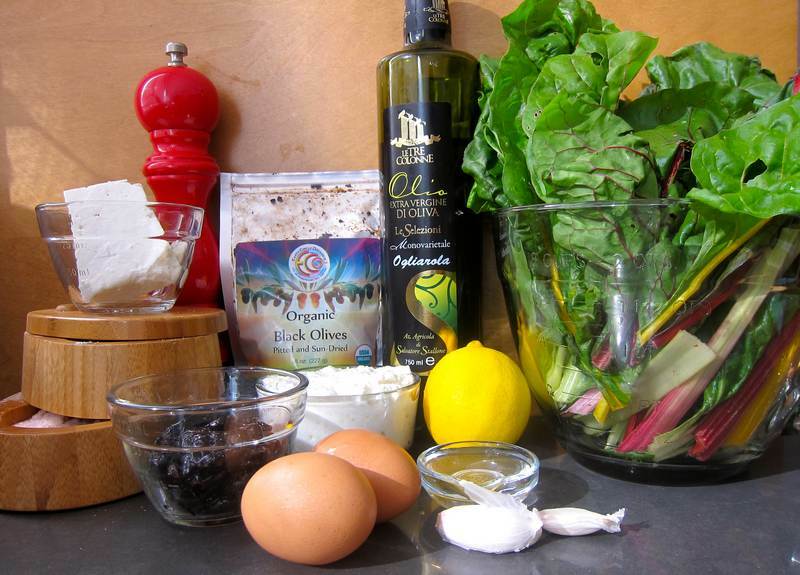 Gather up the ingredients below and throw together your very own Chard Frittata Appetizer. Seriously delicious. You might love it so much that you’ll decide to bump it from appetizer to main event. Slice the chard stems thinly and the leaves roughly. 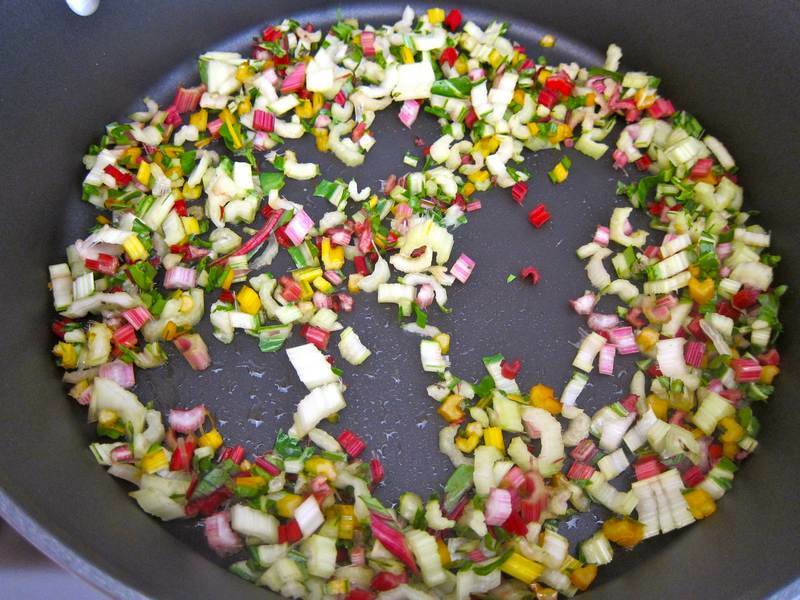 Heat the oil on medium in a large frying pan. Stir fry the stems for 4 minutes, until just tender, adding the garlic when nearly done. Add chard leaves and water and stir 3 to 4 minutes until the leaves are wilted and the water has evaporated. Drain and cool. Mix the eggs, ricotta, lemon zest, salt and pepper in a large bowl. Add the greens, olives and feta. Pour mixture into a shallow 9-inch baking dish coated with a little olive oil. Bake at 350F for 30 to 35 minutes, until the top is lightly browned. Let cool for 10 minutes before cutting into wedges. Serves 4-6. Garnish with sliced cherry tomatoes and dandelion leaves. Serve hot, cold or anywhere in between. 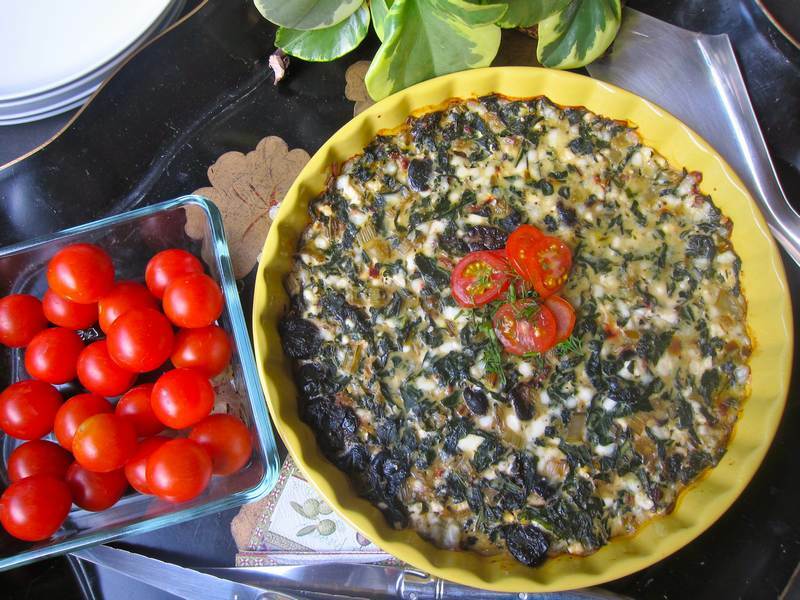 No one will be able to resist the charms of this wonderful Chard Frittata Appetizer. 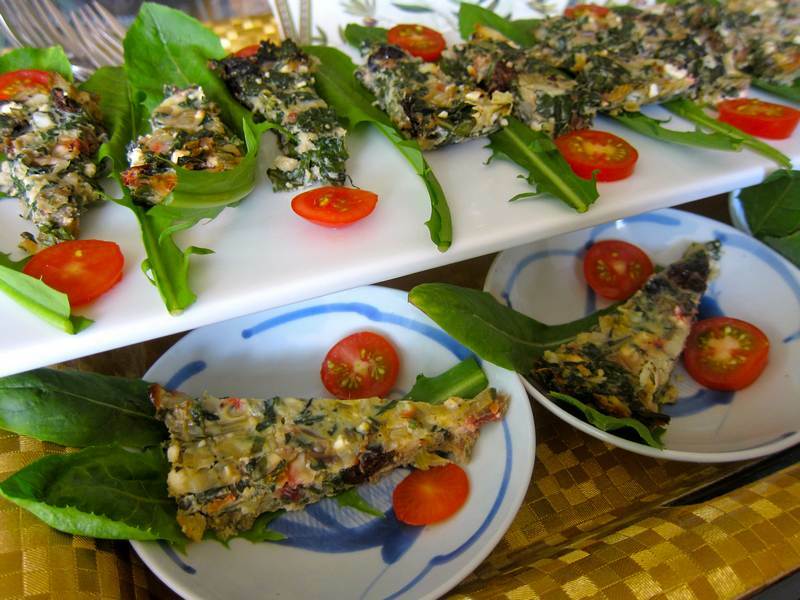 We all wrapped our slices in dandelion leaves—great combo! Thanks to Nancy Cox for bringing me Swiss chard from her garden and insisting that I come up with a good recipe. Nothing like a little incentive! Thanks to multi-talented physiotherapist/organic farmer Sofia Di Guglielmo, for the most ridiculously delicious organic cherry tomatoes we’ve ever tasted. My kids were mad about them. Jittery – update to my new email address! I’ll send you an invite. Thanks for asking! You’ll have catch up recipe reading. Love! Once again your timing is right on (dare I say impeccable again?) We have yellow cherry tomatoes ready to harvest that will look great on top of this dish. Thanks again! Let me know how you like the flavours!